About a month ago, the lovely Nikki Hodum put together a virtual book club (yay!) and September’s book was The Year of the Gadfly. I’ll admit, I had no idea what the book was about and since I bought the e-version, I didn’t have a back jacket to read so when I started reading, everything was fresh and exciting. And the best part is that is stayed that way the entire time! Okay, so here’s why this book is awesome. First, there are three POVs: Iris, Jonah and Lily. Two are teenaged girls and one is a thirty-something biology teacher. At first, I thought that the book was YA but let me tell you, if this book is YA then young adults are way freaking smarter than I give them credit for. Ms. Miller’s prose is sophisticated and smooth—like Earl Grey tea and rich butter scones—and it made a dreary rainy day pass by in the blink of an eye. The plot revolves around a school called Mariana Academy, and like every unbelievably fantastic academically-fierce-high-school drama, the intimate setting keeps the tension at an 11 as Iris tries to discover who's been writing the school's underground paper, The Devil's Advocate. As she researches the paper's origins, she stumbles upon a story that connects former students with current teachers and begins to understand how significant events can have a ripple effect--even decades later. The book goes back and forth between 2012 and 2000 and it must have taken one million years to write because of its dense layers of awesomeness. Seriously. And on her website picture, Ms. Miller looks to be about my age, so there are only two conclusions I can draw: either she’s a literary robot or someone who was literally put on this planet to write fiction (my money’s on the robot hypothesis…not really…okay, like 40/60). Ohmygawd guys, I loved this book so much. SO MUCH! Sorry, I know that’s not really part of my review but I just can’t stop saying it. Oooo, this story is going to be so good. I can just feel it. I love Lily! And Iris! YAY! Two amazing and marginalized female characters with integrity who are also dealing with serious, real-life issues. Joining this bookclub was the best decision of my whole life because I wouldn’t be reading this book without it! What the heck is going on? Who is this Jennifer Miller and has she written anything else? It’s like these characters are so close to me, I could reach out and touch them. Oh man, this book is so good. Maybe I should be more aware of what other people are going through and not be as selfish. Wait…did I just learn a lesson about morality? Holy crap! What was that? And then I hugged The Remix’s iPad and called my CP to tell him that he had to read this book. Which is also the same thing I’m telling you. So, READ THIS BOOK, people! Read it NOW! 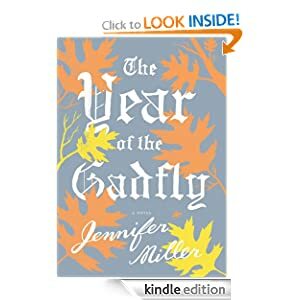 The only bad part about reading The Year of the Gadfly is that I wasn’t able to actually talk to my fellow book clubbers about it because my computer had a meltdown and I couldn’t log onto the Google chat site (boo), which meant that I was full of psych-ness and had nobody to gush about it with. So when you read it, email me and we can gush together! YAY!! I've got to add this one to the list! Sounds great! I will happy discuss the book with you any time friend! It is one of my very favorite books!!!! And you did such a fab job with your review! I am going to do a little write up about book club meeting 1 as soon as I have a free minute and will be linking to your awesome review post! I can't wait for JM to write more! PS: Tell me when you start Gone Girl, cause I want to discuss it! Im only on pg like 35 or 40 and already like WHOAH! Best book review ever! I have the worst time trying to review books but you really just described it perfectly. I also got super drawn into the book in the same way you did- I REALLY wish you were able to be on the chat with us!!!!! Can't wait for next month! Yay for your book reviews! This book sounds great. Adding it to the list!